I said I was from Lahore, the second largest city of Pakistan, ancient capital of the Punjab, home to nearly as many people as New York, layered like a sedimentary plain with the accreted history of invaders from the Aryans to the Mongols to the British (Hamid 7). 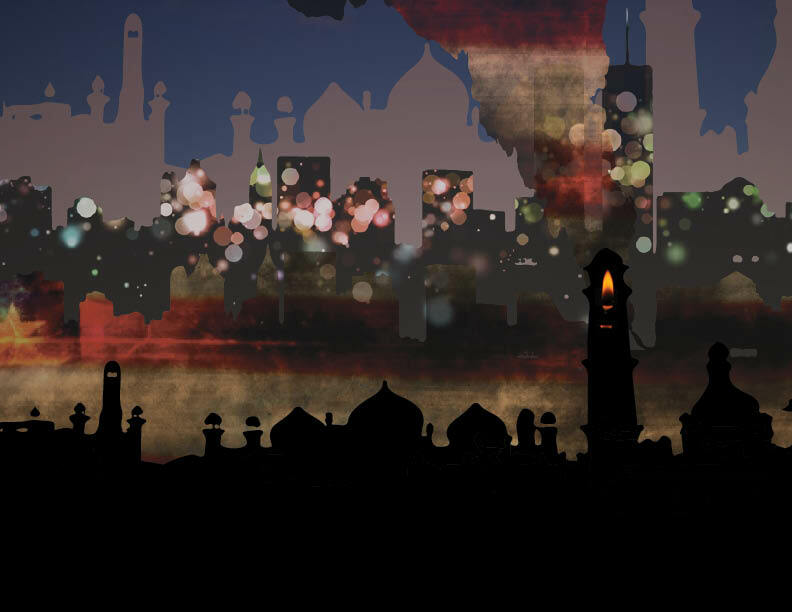 The Reluctant Fundamentalist is a winding yet cohesive narrative—the story of Changez meanders through both time and space and changes do not happen all at once but rather, slowly. In the story Changez is clearly torn between his ties to his home city of Lahore and the glittering modernity that is New York City. The distinction between these two cities and how Changez views them is symbolic of his relationship with each country respectively. Over the course of the novel, each city that Changez lives in leaves its own mark, another layer of sediment in the history of his life. With each skyline, I aim to capture the feeling that that city evoked in Changez and in the reader (although these feelings may not always coincide). More than specific details, the emotions and memories of each location reveal how one man changed and was changed by the places in which he lived. At the very back, the oldest layer is Lahore, Pakistan in Changez’s youth. Although the city is full of warm memories, it is outshone by the sparkling vision that is New York’s skyline. As a young graduate, Changez is clearly impressed with the power and modernity that is Manhattan. However, a reminder of his old home comes when he visits Manila, a city with “walled enclaves for the ultra-rich” (64) and slums for the common man. In the face of this stark and uncomfortable reality, the twin towers fall in the attacks of September 11, 2011. Living in New York was suddenly like living in a film about the Second World War; I, a foreigner, found myself staring out at a set that ought to be viewed not in Technicolor but in grainy black and white (Hamid 115). New York no longer holds the same attraction—the country has become suspicious and Changez is becoming more disillusioned about the nature and intentions of those night lights. In the third skyline we see New York again, but radically different. Physically, the skyline has been altered by the removal of the twin towers but more importantly, emotionally the reader and Changez experience urban life as something strange and removed. Smoke billows from the place the towers once stood, and in their place the colors and hopes of America have become dark. When Changez returns to Lahore, both he and the city have changed. 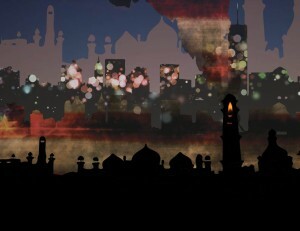 Though the mosques and minarets remain in the skyline, the effects of modern events are also evident. I had, in my own manner, issued a firefly’s glow bright enough to transcend the boundaries of continents and civilizations…I have felt rather like a Kurtz waiting for his Marlowe (Hamid 182, 183). In Lahore once more, Changez chooses both to make a stand and accept his fate. The reference to Heart of Darkness, in conjunction with the careful hope he expresses in education, forms an ambiguous skyline. In the darkness there is a firefly’s glow—whether this is a light in a dark tunnel or the spark of war is a decision we all have to make. This entry was posted on Thursday, May 8th, 2014 at 11:47 pm	and is filed under weekly responses.